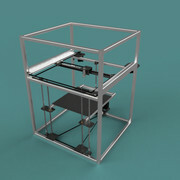 At the start of the holidays I decided that it is time for a 3d printer. a quick search and discovered they are a lot cheaper than the last time I looked this time last year. another quick search and it became apparent that the cheap ones are cheap for a reason. so I have chosen to go down the diy route as I saved a boat load of money when built my cnc router that way and I can tailor the machine to my needs. after spending nearly a week getting it all designed some one just posted a link to the railcore ii which is pretty similar to my final design other than the obvious cut backs! edit: pics updated with jpeg instead of what ever the first ones were!! Edited 3 time(s). Last edit at 12/31/2018 06:14PM by TheHandsomeDog. I would stack the x-y belts and run them inside the linear rails so you could do away with those extra idlers. You're also going to want to support the idlers on top and bottom. They're going to want to tilt as you tension the belts. Same for those on the Z belt. I would actually get rid of one of those idlers there too and support the remaining one on top and bottom too. If you placed your z idlers differently, you could get rid of having to use a separate belt to couple the Z motor to the leadscrews and you'd simplify how you'd have to tension it all, you could just slide the z motor instead of having to do that as well as the idlers. I would add a 4th frame piece for the bed support to make it the full square instead of a u shape. Edited 1 time(s). Last edit at 12/31/2018 01:38PM by FA-MAS. I would stack the x-y belts and run them inside the linear rails so you could do away with those extra idlers. You're also going to want to support the idlers on top and bottom. They're going to want to tilt as you tension the belts. how will stacking the idlers prevent tilt? surely 2 belts on the same post will add to it? or will I need to add top support as well. I originally had a 40t pulley on the xy drive motors which gives exactly the right spacing to remove the idler next to the motors. how ever I read somewhere that the smaller the drive pulley the higher the accuracy will be so a quick and dirty addition was made last minute to keep everything in line. is it detrimental to have the additional idlers? I will be producing the aluminium plates on a cnc as mentioned above so I am not worried about positional accuracy as my machine will do as it is told! I laid out the z in the way I did as I wanted to keep the motors external to the frame envelope. I will be closing in the sides and top to create the heated chamber necessary for abs and wanted the motors to have the best chance they can at staying cool. again the idlers here are a necessary evil to create the right length belt loop. all being well and drawn correctly only 1 will be needed to achieve the right belt tension. the other is only there to give more engagement to the pulley on the left lead screw. working with a fixed loop belt on that z assembly was possibly the hardest part of the drawing process. fusion point blank refused to tell me the length of the sweep used to create the belt, resulting in a lot of trial and error and adding up stupid numbers to 3 decimal places to get the idler locations right. I'm sure there must be an easier way but alas my googlefu was not strong enough to show me how. Edited 1 time(s). Last edit at 12/31/2018 02:37PM by TheHandsomeDog. do you think I should add bed levelling screws between the aluminium plate and the U frame? I had planned on using the 3 lead screws to do the initial levelling as close as possible and then let software do the rest. Stacking the idlers wouldn't prevent tilt, it's supporting the top end that would do that. You'll want to do that regardless if you stack the idlers or not. I was meaning more just to simplify things and so you don't have more idlers than you need. Having extra idlers isn't necessarily detrimental as long as the section of belt that actually moves the axis are parallel to the linear rails. the_digital_dentists printer is a good example of this. You only need to worry about the pulley on the motor, the size and teeth of it will affect the resolution. The idlers could be any size really as long as the section of belt that actually moves the axis are parallel to the linear rails. Think about something like this. 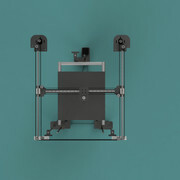 Except leave your rods and leadscrews where they are, the belt would form a triangle, then on the side of that triangle that is parallel with your frame, you mount your motor outside on a plate with slots and idlers so you can slide the motor to tension the belt by sliding the motor. 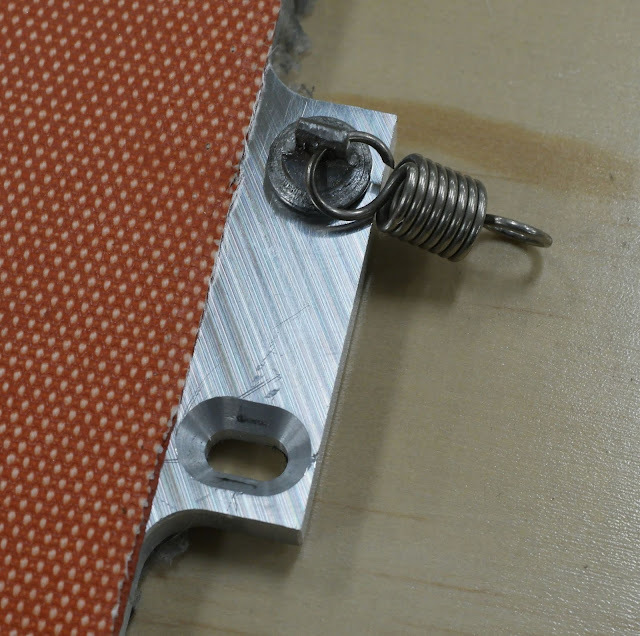 You may want to do leveling screws into something like teflon blocks mounted to the bed support so that it'll be thermally isolated and could take up a little bit of the expansion when the bed plate expands. Edited 2 time(s). Last edit at 12/31/2018 03:44PM by FA-MAS. What format are attached pixs? What is purpose all the space above minimum Z? Why not linear rails on Z? Frame should probably have corner bracing. I have no idea the pic format they are raw straight from fusions render engine, I foolishly assumed they would be jpeg. linear rails run in pairs are hard enough to keep perfectly parallel and true to each other adding a third would add another level of complexity which I'm not sure I would have the patience for. That is a workable solution for sure, In the current design I have a gear reduction in the drive of the z lead screws do you think that is unnecessary ? countering the tilt of the pulleys is a head scratcher for sure. the Y carriages are easy enough but the orders on the frame itself are going to be tough to brace in the direction that force is going to acting. do you have a link to a machine that achieves this? You'll be ok without gearing on the Z axis. A long Nema 17 and the pitch of your leadscrews should handle what you need. To counter the tilt of the idlers, the_digital_dentist made his mounts of square tubing. I'm using a short 32mm NEMA 17 and 4mm pitched ballscrews in my CoreXY. That way you don't loose too much printheight and it has plenty of grunt. But it requires 32bit MCU-power. Another advice: Try to use 'self aligning' bearings for the leadscrews. Edited 2 time(s). Last edit at 01/01/2019 03:08AM by o_lampe. Iim glad you mentioned the self aligning bearings, I had been wondering about using them already. Definitely will now. I left the top of the lead screw unfixed to make sure there are no binding issues, the pillow blocks will allow that freedom without flexing the rods to get it. I just couldn’t decide if it was overkill or not. I will be running a duet 3D so stepping won’t be an issue and the lead screws I have sourced are 1mm pitch t8. Along with the approx 2:1 step down I’m hoping that my 45Ncm stepper can move it all. I have also been thinking a lot about idler tilt. I will accept that the high belt idler stood on a 15mm standoff will likely flex and I think I have a solution to constrain the top. But the low belt idlers are on 1mm shims with m5 hardware through the center. My open builds cnc uses v wheels on 6mm standoffs to resist all the cutting forces and has very little deflection. I know there are multiple wheels spreading the load over distance but how tight are you guys pulling these belts? Well I have. made a couple of tweaks here and there and have ordered the parts I need plus a few extras as I am not 100% no the idler tilt remedy. I went out to the garage and made up a dummy idler rig using bits and pieces. I am very confident that the low level ideas mounted 1mm off the support structure will not flex under the loads that they will see. I'm 70% sure the tall ones will be fine too. Everything depends upon being able to tighten the fixing bolt down hard on to the bearings and still have the idler turn freely. Reading in another thread further down in this forum it seems that most cheap idlers are not made well enough to permit this. once construction begins I will continue this thread. Edited 1 time(s). Last edit at 01/01/2019 03:11PM by TheHandsomeDog. Most of the cheap idlers have two bearings pressed into an aluminum pulley with flanges. There is no spacer between the two bearings, so if you crank a screw down on them, you add a huge load that will either break the bearing outright or will cause it to grind into the races. Those pulleys need to be mounted in a way that restricts their vertical/axial movement without side loading the bearings. Try shoulder screws. One of the problems with those pulleys is that the bore must be very small, typically 3 mm, in order to fit the tiny bearings into the pulley. A 3 mm bolt/screw is pretty flexible when subjected to belt tension, so unless you support both ends of the bolt/screw it will flex. Under an equivalent load, small bearings will wear out faster than larger bearings. Small pulleys are more likely to create print artifacts than larger pulleys, too, especially if the belt teeth have to contact a smooth pulley surface. Look at using flanged ball bearings for the pulleys instead. They typically have larger bore which means the mounting bolt is less likely to flex, and they will last much longer than than the tiny bearings in pulleys. Yes, flanged bearings and large bore axles will weigh more than the tiny pulleys, but your machine will operate longer with less maintenance. adding a third would add another level of complexity which I'm not sure I would have the patience for." ?? Over - constraint ??? binding ??? The DD UMMD only uses 2 linear rails on Z. 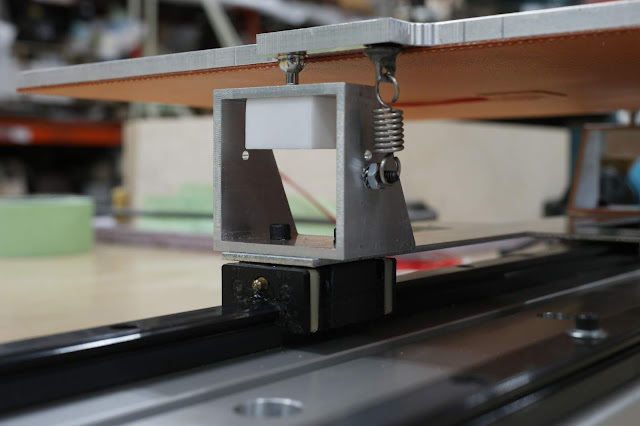 If you anchor the bed plate directly to the guide rails, when it heats up it will expand and push against the Z axis screws/guides and something will have to flex or tilt. 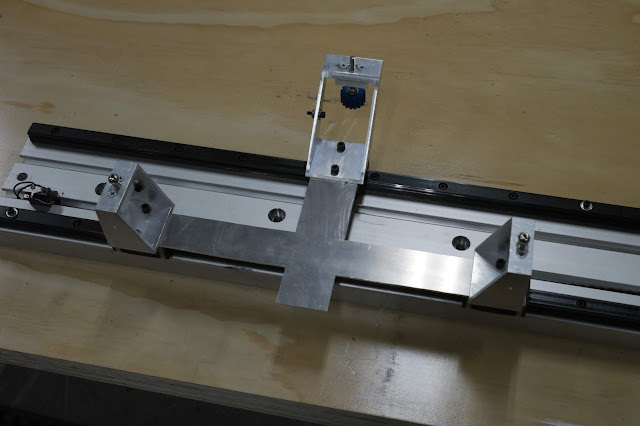 If you don't want to make a substructure that ties the Z axis screws and bearing blocks together, it should be possible to incorporate the kinematic mount on the three screw system by using L brackets attached to the linear guides and screws, with the levelers mounted on the brackets. If you're going to lift the bed with 3 screws, and you use a Duet controller with an expansion board, you can use the lifting screws to level the bed automatically every time you turn on the printer. You'll still want some means to allow for thermal expansion of the bed plate. Edited 2 time(s). Last edit at 01/03/2019 04:25PM by the_digital_dentist. That kinematic mount is interesting. Do you find that as the bed expands it creeps up the inclined surface of the countersink? I’m guessing it would be negligible accross the distance to the next nearest mount. My current solution is a little less elegant. 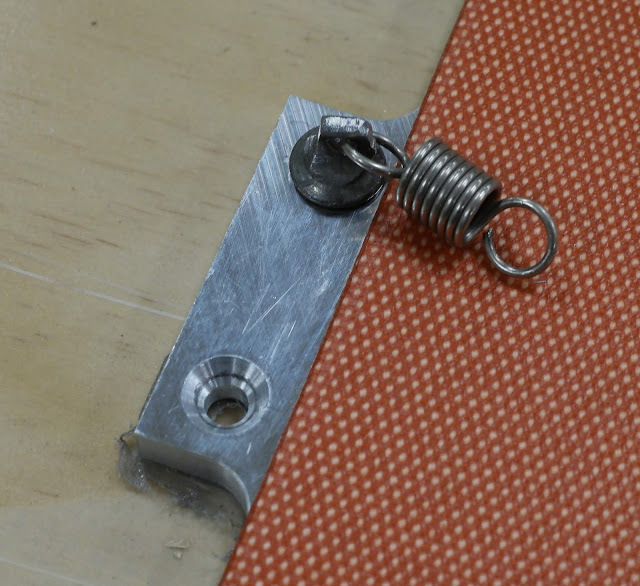 As I will already have the ability to adjust the bed plane with the lead screws I was thinking of using neo magnets to hold the bed in place, they would allow for an amount of ‘slip’ in xy but hold enough to stop the bed moving. You may want to look into klipper, which my slash price more than in half by using Raspberry pi and 2 boards to expand the number of available stepper drivers for 3 or 4 independent Z motors. No, the bed doesn't creep up the chamfers in the reference hole or the pitch slot. 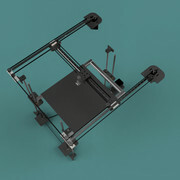 That's the whole point of the kinematic mount- the bed is free to expand but it can do anything else. At the reference screw the bed can only tilt for leveling and bed height adjustment. The pitch leveler sits in a slot that is aligned in the direction of the bed's thermal expansion. The bed is free to slide on the pitch screw and tilt for leveling. At the reference adjuster, the bed is free to slide in X and Y as the bed expands when heated and contracts when it cools. The only way the bed could climb the chamfer at the pitch slot would be if the slot were too short or the screw incorrectly positioned in the slot. A 300mm bed expands about 0.6 mm when heated to ABS print temperature, so as long as the slot is at least that long, it should work fine. I don't recall the exact number, but I made the slots 3-4 mm long, so there's no chance an expanding bed will run out of slot. I used a Kelvin type kinematic mount. There is another type called a Maxwell kinematic mount. I used the Kelvin type because it was easier to fabricate using the tools I had available. Here's the reference adjuster sitting in the chamfered hole. The screw is an RC car part with a 2.5 mm hex socket on top that I access through the hole in the bed plate. The screw is driven into a teflon block that doesn't soften or melt when the screw gets hot. Making this type of mount is very easy if you have a milling machine, but a mill isn't really necessary. A simple hole, that you can make with any drill, that is not quite large enough for the screw head is sufficient at the reference end. You can attach something to the plate that will serve as the slot for the pitch adjuster- you don't have to mill a slot into the plate. A piece of aluminum U channel screwed (epoxied?) to the plate should work fine. You can cut aluminum plate with a hack saw if you have to, but a band saw or even a jig saw should be able to do it with a metal cutting blade. I have put this kinematic mount on two printers, one with the bed moving in Z and the other a bed flinger, and it works perfectly. Leveling and zeroing are both stable and don't require any adjustment after initial set-up which is very easy because of the way the screws are arranged. You move the nozzle near the reference adjuster and use it to set the height of the bed, then go to the pitch adjuster and level the bed in the Y axis (the way I built it), then go to the roll adjuster and adjust level in the X axis (roll adjustment doesn't affect pitch). The rest of the printer structure contributes to stability, of course, so if you put a kinematic mount on a flimsy frame you may still end up tweaking it a lot. Edited 1 time(s). Last edit at 01/04/2019 11:26AM by the_digital_dentist. Thank you for the detailed response I see exactly what you mean about the slot sizing. For some reason I had a much larger number in my for the amount of expansion. Don’t laugh but it thought it would be double that! As my z motion already has the 3 point levelling ability with the lead screws I will not need the bed mounts to accommodate any adjustment vertically. I know it will be a faff to set up initially but once set the bed plane should not drift. I will make the initial levelling adjustment by releasing two of the drive pulleys on the bottom of the lead screws and adjust the pitch and yaw around the fixed screw the same way as you. Once levelled I can tighten the grub screws on the 20t drive pulleys onto the lead screws. My current thinking is to machine a shallow 20mm dia x 1mm deep pocket into the under side of the bed plate and expoxing in a neodymium magnet at each corner. Then on the bed frame fixing the same sized magnet but one with a pre made counter sink hole. As the bed frame will be made out of 2020 this will be made easy by using a t nut. The plate would be free to expand while maintaining a fixed z height on the magnets. As an added bonus it would make removing the bed plate very easy should the need arise. Edited 1 time(s). Last edit at 01/04/2019 02:45PM by TheHandsomeDog. If you want to try to recover from a power failure or to shut down a print at night then restart it the next day, when the bed heats up it may not return to the exact same position unless you somehow index the bed. If the bed doesn't go back to the exact same position it will create a defect in the print. The reference screw in my kinematic layout indexes the bed, and the rest of the mechanism ensures that it will be always be the same size and position at any given temperature. 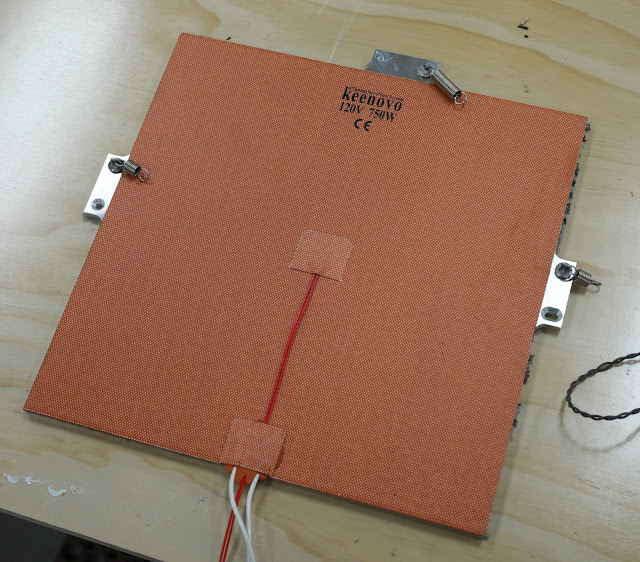 If you use magnets instead of a kinematic mount, and had mechanical stops for the bed plate, you could push it against the stops when it's hot to ensure that it got back to the exact same position. 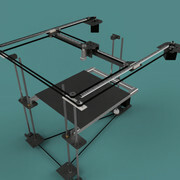 The kinematic mount doesn't require the hold-down springs if the bed moves in the Z axis. The weight of the bed will keep it in place. I used springs in my coreXY printer so that when I transport the machine laying on its back I don't have to secure the bed separately. The springs are necessary in a printer that moves the bed in the Y axis. Wow thank you. This is exactly the constructive input I was hoping for when I first posted. If I understand correctly your fix in this situation would be to lock one corner of the bed to the bed rails then constrain rotation around the fixing using blocks along the 2 adjacent sides. then other 2 sides would be left to expand and contract around said fixed point. Starting to turn into a lot of work but still preferable to springs pushing up on the bed plate. Though starting to see the merit of the Kinematics more and more. Klipper looks like the solution. Thank you very much this is exactly what I have been looking for. I know it is off the topic but would like to hear an opinion. I do believe that restart is useful only for printing with cold - not heated bed. If the bed cools down the printing part will get off the bed. In Marlin's power failure algorithm, the restart is not automated, but manual. 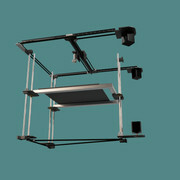 So even after short power loss, before a user selects to continue printing bed will cool down as well. The easy solution may be to home Z to MAX instead of MIN (what Delta printers usually do) this may require a change in restart algorithm. I was not referring to the bed going back to the same Z position. The bed should not move in Z when power is cut. I was referring to the expansion of the bed in the XY plane. If the bed isn't indexed in the XY plane, the next time it heats up it may shift to a slightly different position which would create a discontinuity in the print surface. Some materials will remain stuck to the bed when the plate cools down. PLA and TPU will usually remain stuck to PEI. ABS may or may not remain stuck. ok so now thanks to piper3d I am onto revision 5 of the printer, I think there is going to be a few left over parts as parts for the mk4 are already on route!!! the Klipper software looks awesome why is it not more prevalent am I missing something? the ability to just add a second, third, forth.... control board pretty much gives an unlimited number of connection / upgrade options. does anyone have any experience of this board? google doesn't seem to throw much up on it. I did find the pinout for it which makes mapping 3 of the drivers to z a breeze in Klipper and leaves me an x, y and extruder motor. If one day I decide to add another extruder then a second cheap board with a couple of drivers is all I will need. so fusion is fired up and new motor mounts are on their way!!! ?? are you modifying Z to Three motor drive?? All you need here is a calliope and a ring master? haha made me spill my coffee!!! All the hard work is done by the pi leaving the chip on the F6 very little to do other than send the command at the right time. I thought octoprint was held in fairly high regard as a print controller is this not the case? I'm assuming your choice would be the duet2 wifi? Edited 1 time(s). Last edit at 01/06/2019 01:57PM by MKSA.